Why? Why does it have to be like this? On the one hand, good job on crafting a story that delivers a strong, emotional impact. On the other hand, could you really fail with these ingredients? Looking at this list, how can you not succeed in making the audience weep (barring a few exceptions). Plus, you can’t help but feel as though Mio’s story comes super close to yet another example of a woman being stuck in a fridge just to help push the main character’s development forward. She was never meant to survive — she never had a chance! — but she does play an important role… for Hyakkimaru, that is. He may have gotten his voice back, but that doesn’t mean that he’s going to start using it. 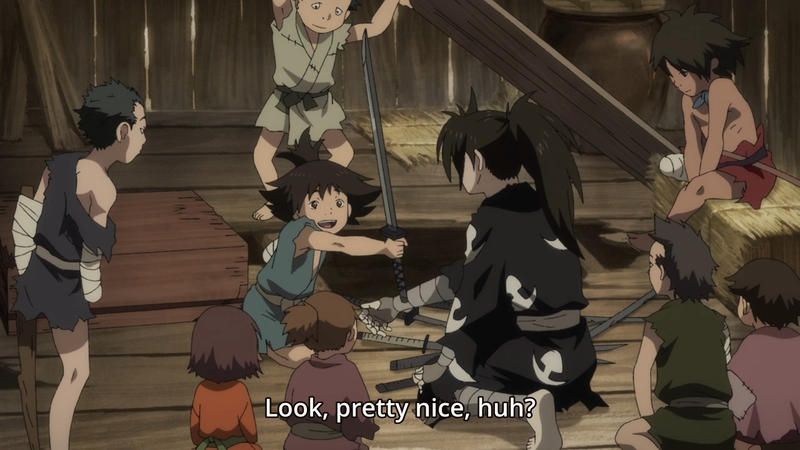 Both Mio and Dororo try to get him to speak, but he remains mute. The only time we’ve heard his voice was when he cried out in pain shortly after losing his leg. There are obviously different kinds of pain. When our hero first got his nervous system back, he finally got to experience physical pain. 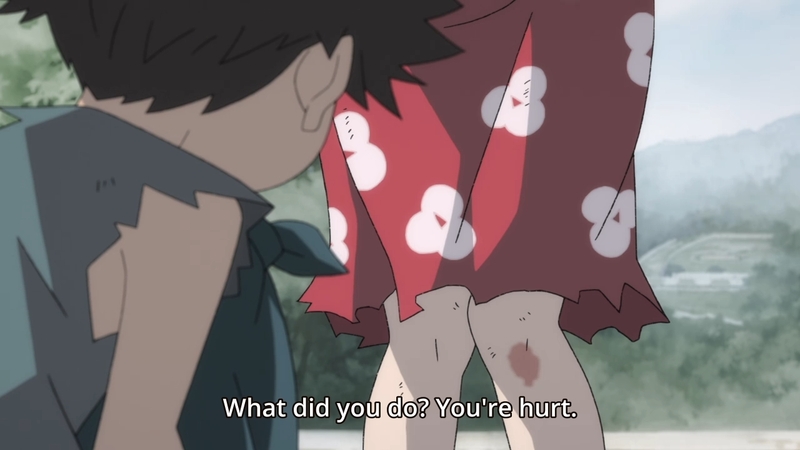 But thanks to Mio and her unfortunate death, he now knows emotional pain. Our hero lets out a painful, agonizing cry as he begins to slaughter all of the samurais around him. 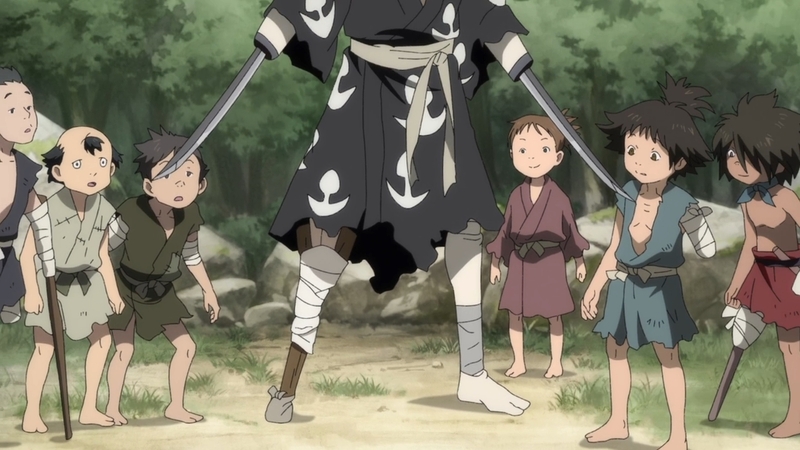 This soon prompts Dororo to grab onto his friend in fear. The old man had warned the kid that Hyakkimaru getting his body parts back was akin to freeing a beast from its cave. You can only hope that the beast is friendly. 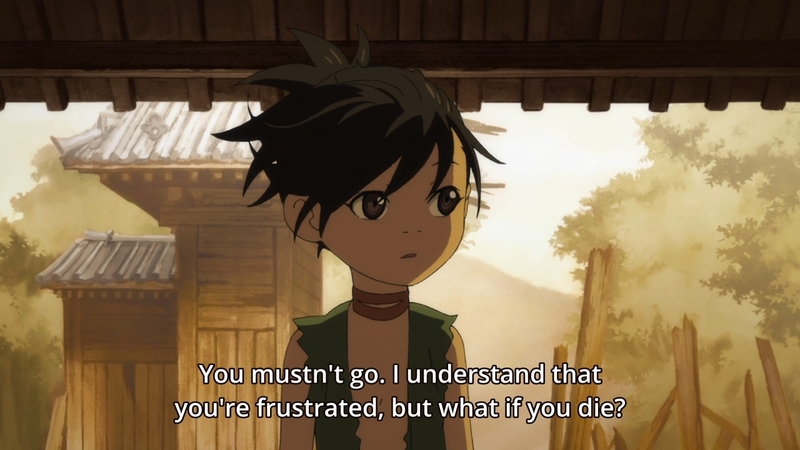 As a result, Dororo fears that Mio’s death might cause the guy to turn into a monster. Ironic, isn’t it? 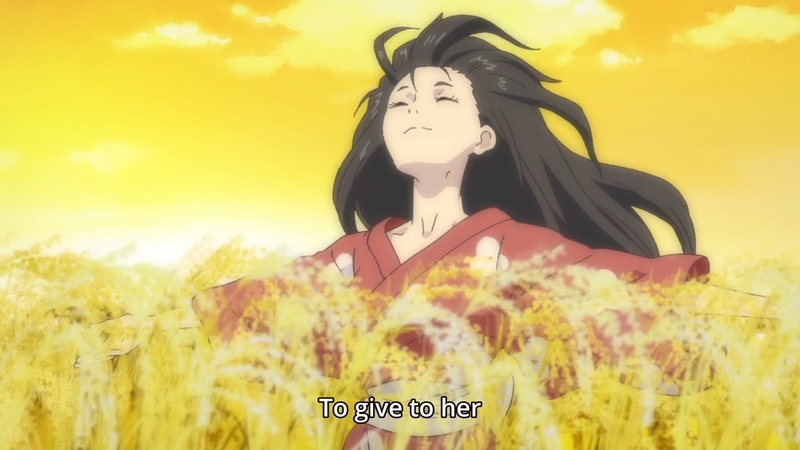 Dororo calms him down by showing him those golden seed rice that Mio had collected. This shows that he’s no monster. No monster would’ve understood that gesture. The guy just experienced his first love, and subsequently, his first heartbreak. Finally, he embraces her lifeless body and utters his first word. 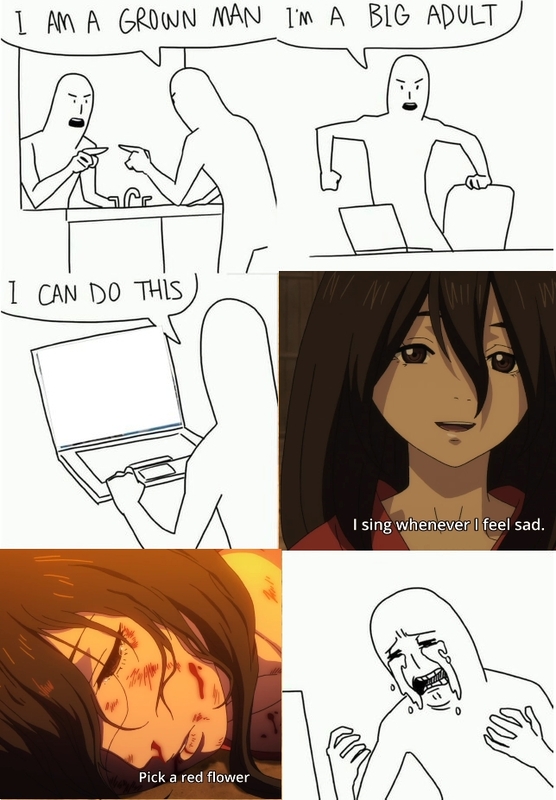 None of this would’ve been possible without creating a tragic character like Mio, then cutting her life short. Sigh. To nobody’s surprised, one of the samurai factions retaliated because Mio started working both camps. They thought that she and the children might actually be spies. How pitiful. What’s particularly heartwrenching isn’t just the fact that the poor woman is singing to herself as she slowly bleeds out. She’s singing to herself because she more than likely blames herself for the children’s death. If only Mio had taken her own advice. She tells Hyakkimaru to stay put, because he can’t push himself too hard. If he tries to slay the demon before he is ready, he’s just going to get herself killed. And yet, she pushes herself too hard. Every morning, she returns to the children with fresh bruises. This goes on for quite some time, too. 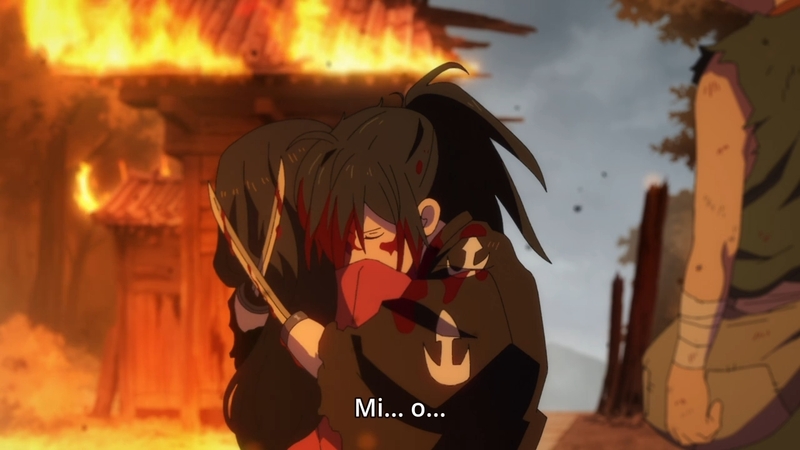 It’s never specifically stated how long Hyakkimaru and Dororo stayed at the temple with Mio and the orphans, but they stayed long enough for our hero to recover. They stayed long enough for the kids to warm to him as well. And throughout this entire time, Mio insisted on him staying put, but she would go out every day to sell her body. Of course, we don’t blame her. We can’t blame her. Without Mio, these orphans probably would’ve lost their lives a long time ago. Rather, we know who or what to blame. War, of course. But as life ebbs from the woman’s eyes, all she can do is sing as her world burns down around her. Again, the most painful thing about this episode is the realization that Mio probably blames herself. 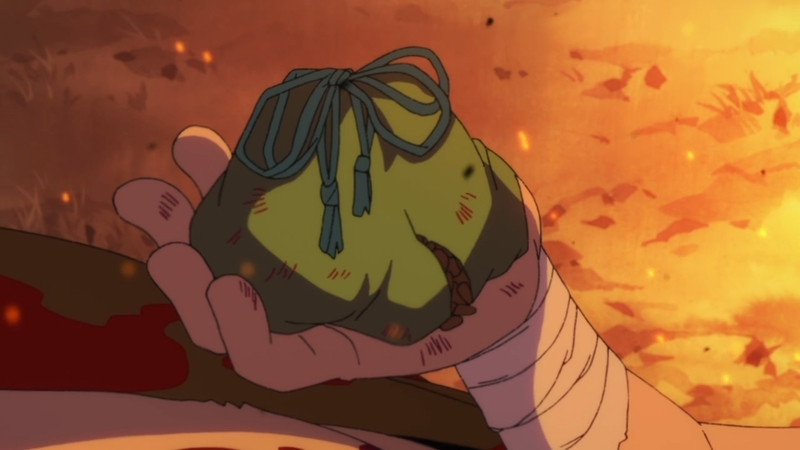 Midway through the episode, the woman puts on a brave smile and tells Dororo that she isn’t ashamed of her job. 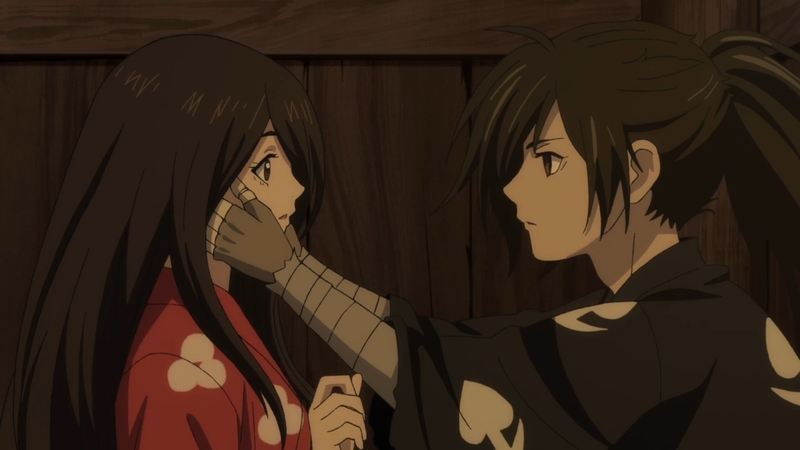 But whenever Hyakkimaru looks at her for too long, she recoils uncomfortably. Hm. Alright, what else should I cover before wrapping this post up…? — Oh yeah, I guess I got a little confused. Y’see, I thought he only got his voice back because he had defeated that demon, but this is apparently not the case. 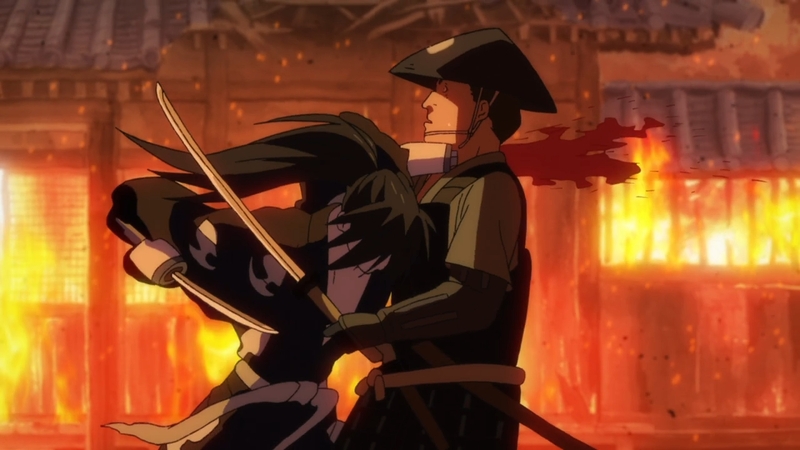 The demon is still alive, and Hyakkimaru finally kills it before the episode is over. 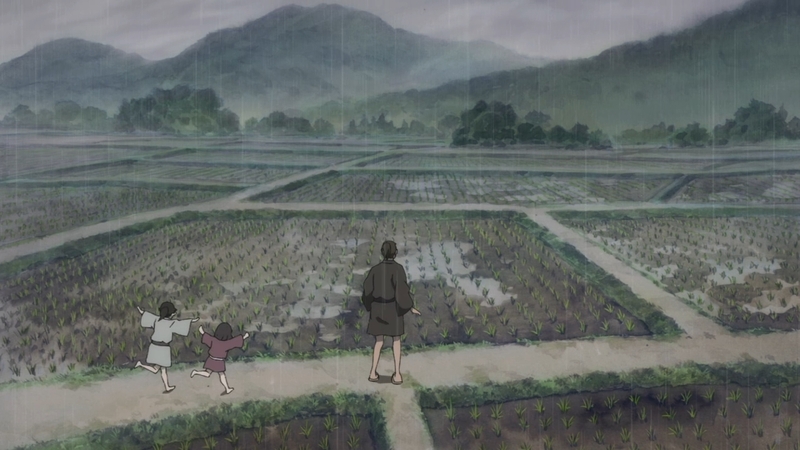 — During our hero’s final battle against the demon, the parched land suddenly begins to receive much needed rainfall. But as soon as Hyakkimaru wins, the clouds disperse and the rain comes to an end. Really makes you wonder, doesn’t it? Is it really his fault that everyone is suffering from this drought? 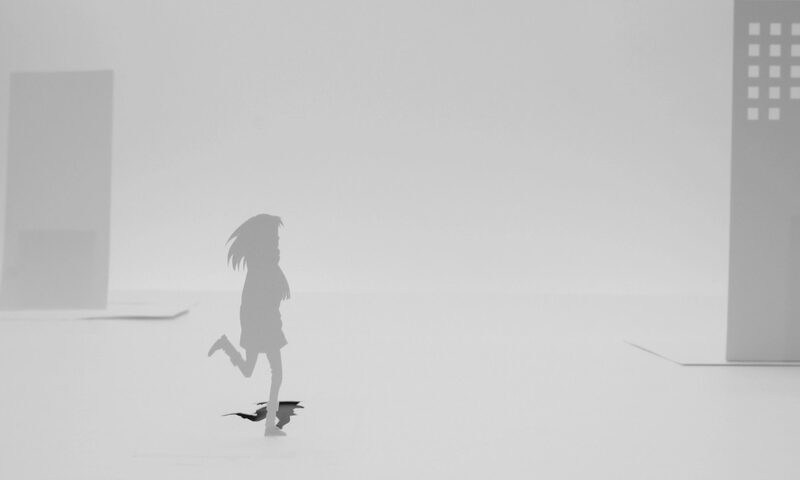 — Moving along, we learn that Dororo’s mother had died because she refused to do what Mio is doing. In this harsh, cruel world, most people can preserve their dignity, but only at the cost of their own life. 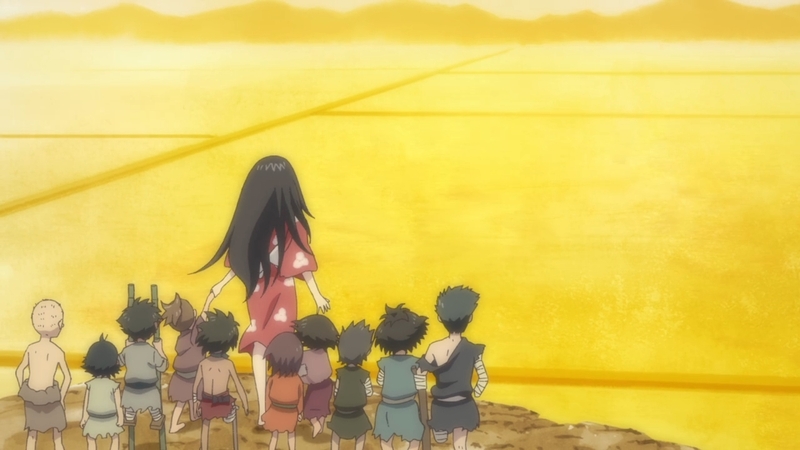 One can only wonder how this will all turn out for Dororo in the end. Is he just going to stick with Hyakkimaru for life? 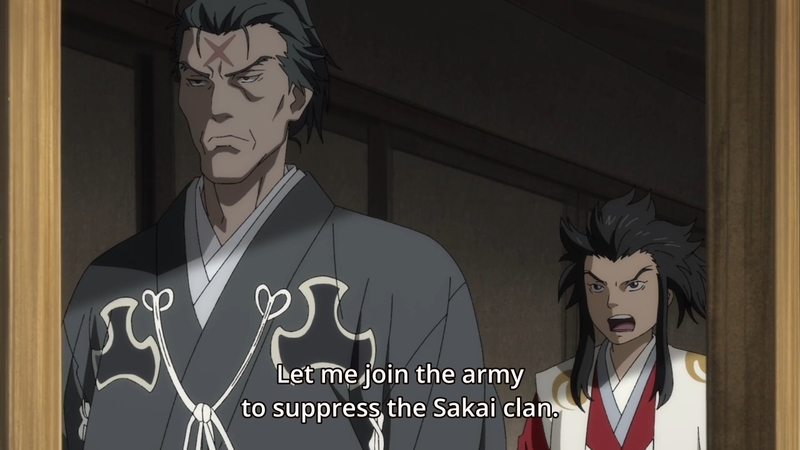 — Speaking of growing up, Tahomaru, our hero’s younger brother, wants to join the war effort. What are we fighting for? Beats me. But like a lot of men from that time, he believes that he can make a name for himself by slaughtering other people. Needless to say, his father doesn’t allow his son to risk his own life for something so intangible. Too bad the old man couldn’t feel the same way about his first son. — The young man then reveals that he has always felt as though both his parents are hiding a deep, dark secret from him (they are!). Not only that, he has noticed all his life that there’s something missing from his mother’s love. She’s kind to him, but she isn’t proud of him. Does that mean she’s ashamed of him? No. 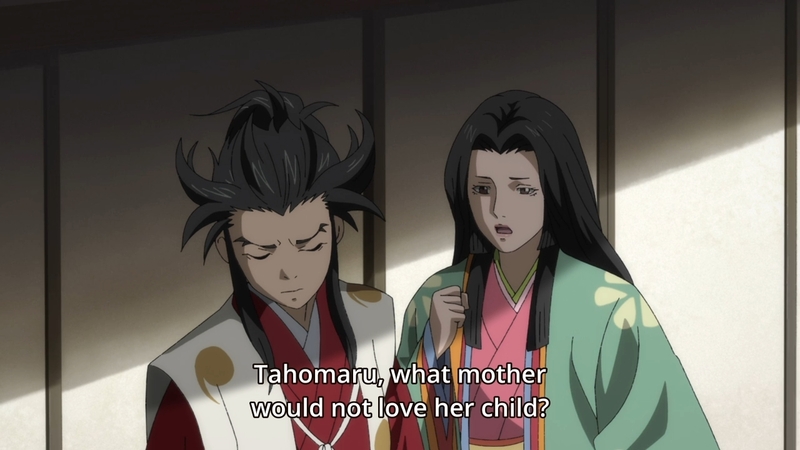 It’s more that she’ll never get over the loss of her first son, and as a result, she neglects to show Tahomaru the attention that he craves. Obviously, Hyakkimaru has it even worse. He’s literally never known his mother’s warmth. 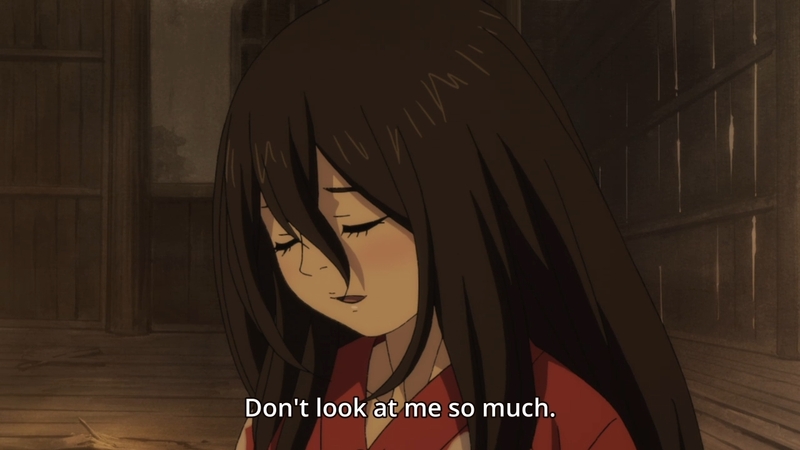 But that doesn’t mean we should dismiss Tahomaru’s pain either. In a flashback, we get to see how the kid endangered himself by climbing a tall tree, and his mother wasn’t even looking. 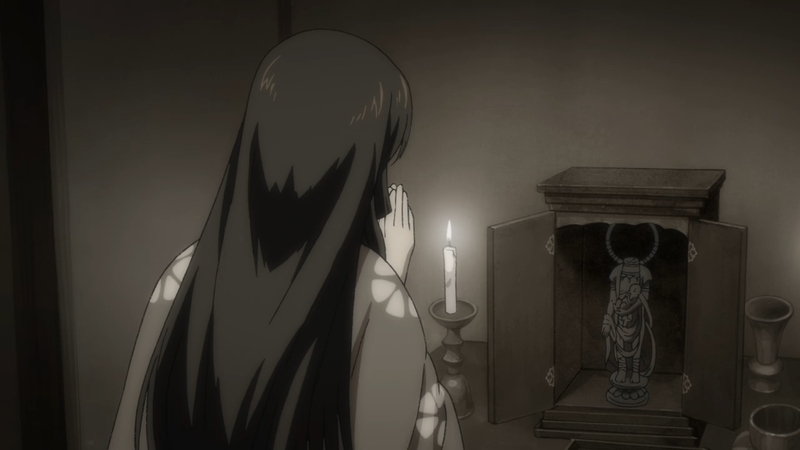 She was busy praying to that statue that had sacrificed itself for Hyakkimaru. Maybe the woman still believes that her first born is out there. Or maybe she just wants to give him some comfort in the afterlife. Either way, the story is building up to a potential clash between the two brothers. — Ugh, I need a pick-me-up. Your writeups for the last three episodes (including this one) were nice by the way! I enjoyed reading them. Geez Sean, looks like this one got you in your feels. Can’t see how anyone can say you don’t enjoy watching anime after reading this post, but I guess the irony is your posts that are deemed the unpopular opinion or against the mainstream gets more comments. Anyway, hope all is well and keep up the great work! Oh, I just skimmed through the manga, and I think the anime has elevated the source material quite a lot. In the manga, Hyakkimaru could communicate normally through telepath even when he was still living with the good doctor, and he is quite a talkative, somewhat cheerful young man, doesn’t seem like being very haunted by his trauma or unsual upbringing. The manga Hyakkimaru is deffinitely a healthy – mind, positive young man. The anime eliminated that telepath stuff ( a clever decision, much as I like Tezuka, his writing could feel very dated sometimes) and makes Hyakkimaru…very doll-like, somewhat inhuman right in the begining. Some Tezuka die-hard fan criticized this change, but I think it’s more logical and more tragic for the guy to eventually regain humanity, and also regain the pain of being human. This adaptation is definitely much better than the source material so far. In that case, she definitely fits the trope of women being stuck in fridges for the sake of the main character. A shame, really. The adaptation is a bit better in regards to this, but it still leaves a bad taste in my mouth. We’re not talking about a character with an organic role in the story. She’s just here to break our hearts. Yes, Osamu Tezuka’s writing is definitely very dated. At his time probably this cliche has not been criticized very much. Ah, I forgot about it. Happy Lunar New Year. Yup, it’s hard to botch it up when the anime have all those factors. And I know the anime is competent enough to deliver it. I personally prefer it over the manga so far. This anime is a damn good adaptation.